Stock status is current as of 4/24/2019 6:48 AMET. 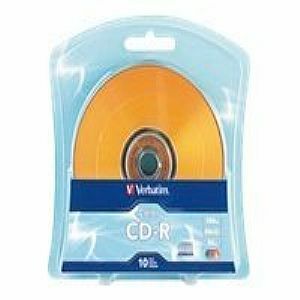 Verbatim's CD-R discs come in five vibrant colors - blue, green, purple, pink, and orange - These stylish high-grade discs deliver reliable recording even at blazing drive speeds, completing a full 700MB/80min recording in less than 2 minutes. Verbatim CD-R media is tested and certified by leading 52X drive manufacturers. Combining this level of performance and excellent reliability, Verbatim's CD-Recordable media are the ideal storage medium for recording and sharing any combination of digital images, music, desktop files and more. These are one-time record discs, ensuring your valuable files will not be erased.